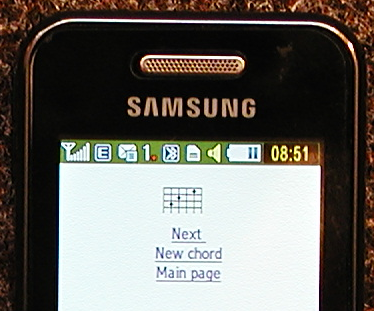 The guitar chords java applet has very user friendly interface. It is designed for a HTML browser. If you play a guitar, seldom you are beside a computer. But a mobile phone you have on you almost every time. Enter the address www.kytara.cz/wchords/ to the WAP browser in your mobile phone and simply find needed chords or browse other guitar wap pages.